This antibody targets conjugated Trans-Hydroxyproline, it does not recognize free Trans-Hydroxyproline. Synthetic peptide corresponding to Hydroxyproline conjugated to bovine serum albumin. Antibody is purified via a salt cut, and then BSA antibodies are pre-adsorbed away. Antisera antibody was lyophilized and then reconstituted in buffer. Our Abpromise guarantee covers the use of ab37067 in the following tested applications. Hydroxyproline, a non-essential amino acid derived from proline, with no known therapeutic use. Hydroxproline is used as a major component of structural protiens such as collagen, connective tissues, plant cell walls, tendons and ligaments and provides skin elasticity. Vitiman C is required for the conversion process from proline to hydroxyproline, a deficincy in vitiman C can lead to defects in collagen synthesis, thus, resulting in easy bruising, internal bleeding, breakdown of connective tissue of the ligaments and tendons, and increased risk to blood vessel damage. An unusual feature of this amino acid is that, it is not incorporated into collagen during biosynthesis at the ribosomal level, but is formed from proline by a posttranslational modification by an enzymatic hydroxylation reaction. 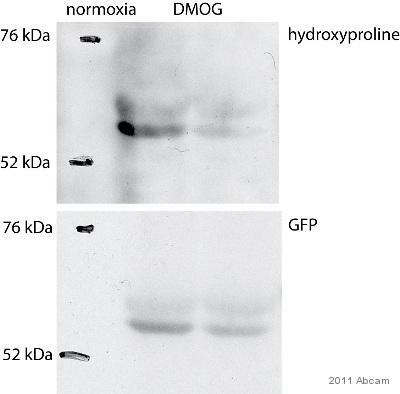 Western blot - Anti-Hydroxyproline antibody (ab37067)Image courtesy of an anonymous Abreview. 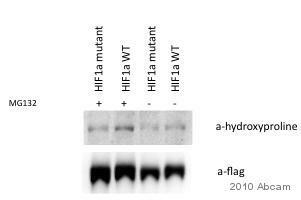 WT flag tagged HIF1a was transfected into HEK293T cells. After 48 hours cells were treated with MG132 or DMSO for 6 hours. Cell lysates were subjected to Immunoprecipitation. Samples were separated in SDS-PAGE for Western blotting. Negative control: Flag tagged HIF1a mutant (Proline mutants). Publishing research using ab37067? Please let us know so that we can cite the reference in this datasheet. I can confirm that ab37067 will detect conjugated Trans-Hydroxyproline. It will not matter to what Trans-Hydroxyproline is conjugated and therefore we expect ab37067 to also bind collagen chains if they have Trans-Hydroxyproline. This has not been tested experimentally by us. What is IHC dilution rate or ab concentration for Anti-Hydroxyproline antibody (ab37067)? Accourding to this information, firstly we will determine the number of IHC test per bootle. Thank you for contacting us. The dilution must be optimized by the end user but we would recommend 1/100 as a starting point for IHC. I used human cancer cell lysates for IP (1:300 dilution of ab37067) and western blot (1:500 dilution of ab37067). The samples were run in denatured SDS-PAGE. 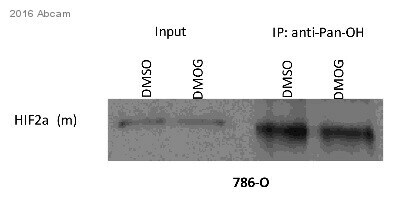 The antibody was incubated with cell lysates (for IP) or membrane (western blot) overnight at 4oC. I used TBST as wash buffer in the western blot assay, and donkey anti-rabbit IgG-HRP (1:2000) as the secondary antibody at RT for 1 h. I don't think that my protocol has the problem because another hydroxyproline ab purchased on Nov. 2011 gave the strong signal. Thank you for you response and for sending addition details regarding your protocol. As always, this product is covered by our Abpromise guarantee we will replace it under our Abpromise guarantee, as you are using it according to specifications listed on our datasheet. The confirmation number for this free of charge replacement is. Because of the upcoming holiday, it will be sent on Monday for Tuesday delivery. Please let me know if you have any questions or there are other ways that Abcam may help you meet your research goals. I am sorry about the issues you have been having. Thank you for bringing this to our attention. Thank you for providing information about your protocol. As company policy, in order to send a replacement we do need to know protocol information. This information is important not only in helping us understand the problems that you are experiencing but in our internal testing as well. I do have a few questions about the Western Blot protocol and was hoping that you might provide some additional information for me. Could you please tell me what species you are using this product on? Were your samples reduced and denatured? Did you use a loading control and positive control? Were you able to run a no primary negative control? This is a polyclonal antibody. As such variations in efficiency between lots is common. What dilutions of this product did you use? How long and at what temperature was this antibody incubated? What was the secondary antibody that you have used? How long and at what temperature was this antibody incubated? What is the wash buffer that you use? Could you provide the Abcam order confirmation number or PO number used to purchase this? Thank you very much for taking the time to answer these questions. Please contact me if you have any questions or concerns. Thank you for providing this information. Having reviewed all the details provided, I believe this product should have given satisfactory results but clearly hasn't. It appears that you may have received a faulty vial. This will be investigated. I apologise for the inconvenience caused. The antibody is covered by the Abcam Abpromise and am able to offer you a free of charge replacement, although we unfortunately only have the same lot that you received in stock at present. Alternatively I can provide you with a credit note in compensation. Thank you for your cooperation. I look forward to hearing from you with details of how you would like to proceed. DESCRIPTION OF THE PROBLEM No signal or weak signal SAMPLE Whole cell lysate from target-protein overexpressed 293 cell line PRIMARY ANTIBODY Concentration or dilution 1:500, 1:250 Diluent buffer : 0.5% BSA in TBST with Sodium Azide Incubation time : Overnight Incubation temperature: 4C Wash Buffer : TBST Number of washes : 5 min x 3times DETECTION METHOD ECL POSITIVE AND NEGATIVE CONTROLS USED Positive control : Does not Work Negative control : IP with IgG ANTIBODY STORAGE CONDITIONS -20C SAMPLE PREPARATION Lysis buffer : general lysis buffer with 0.5% NP-40 and 1% Triton X-100 Protease inhibitors: PMSF and P/I cocktail from Roche Phosphatase inhibitors : NaF and NaVO3 Reducing agent : DTT Boiling for ≥5 min? : Yes AMOUNT OF PROTEIN LOADED Using 500ug of protein for IP/WB ELECTROPHORESIS/GEL CONDITIONS SDS-PAGE gel TRANSFER AND BLOCKING CONDITIONS Type of membrane : NC Protein transfer verified : 200mA for 2:30hrs Blocking agent and concentration : 0.5% BSA Blocking time : Over 1 hr Blocking temperature : Room Temp. SECONDARY ANTIBODY anti-Rabbit HRP Concentration or dilution : 1/10000 Diluent buffer : 10% glycerol Incubation time : 1hr Incubation temperature: Room Temp. Wash Buffer : TBST Number of washes : 5 min x 3times HOW MANY TIMES HAVE YOU TRIED THE APPLICATION? 3 HAVE YOU RUN A "NO PRIMARY" CONTROL? Yes DO YOU OBTAIN THE SAME RESULTS EVERY TIME? Yes WHAT STEPS HAVE YOU ALTERED? primary antibody concentration ADDITIONAL NOTES To investigate novel hydroxylated protein, we firstly tested quality of purchased antibody. To do this, we transiently overexpressed well-known hydroxylated proteins, like HIF-1a and PKM2 to 293 cells using lipofectamine, and prepared whole cell lysate with lysis buffer. WCL from 293 cells then immunoprecipated using each tagging antibody (anti-Myc in case of PKM2 and anti-HA in case of HIF1a). Overnightly immunoprecipitated sample were washed for three times then used for western-blot with hydroxyproline antibody, but we failed to detect hydrxoylated PKM2 or HIF1a. Input lane showed that each proteins were efficiently overexpressed, which means that Hydroxyproline Ab did not work properly. Thus I’d like to request claim for this purchased product. Thank you for contacting us. I am sorry to hear you are experiencing difficulties with one of our products. We take product complaints very seriously, and investigate every product that we feel may not be performing correctly. Having reviewed your protocol and blot I have a few questions. Just to clarify, did you stain the gel following electrophoresis in order to confirm that there was some protein present following the immunoprecipitation? Also, did you use the Anti-Hydroxyproline antibody (ab37067) directly on the WCL to observe the activity? In the case of HIF-1a, its hydroxylation triggers the degradation of the protein by pVHL mediated ubiquitination and proteasomal breakdown. The hydroxylated form of the protein may therefore be in very low abundance. We have a product in our catalogue which might be very useful to you as a positive control: https://www.abcam.com/ab93631 This protein is a Bovine Serum Albumin with trans-hydroxyproline which was used as the immunogen to the antibody you have been using (ab37067). This should be observed as a band at around 67 kDa. I look forward to receiving your reply. Customer would like to know if we can offer anti proline-glycine-glycine or anti proline-glycine-proline antibodies. Thank you for contacting us. We have anti glycine or anti- proline antibodies in our catalogue. The catalogue numbers are ab9344, ab9345, ab37067, ab9442 and ab37087. We unfortunately do not have antibodies available specifically raised against proline-glycine-proline short peptide. I would like to recommend checking the Biocompare website which has an excellent antibody search facility that includes many suppliers. The links are: www.biocompare.com http://www.biocompare.com/ProductCategories/2045/Antibodies.html Elastin proteins also have repeating units of proline and glycine residues. So probably monoclonal antibodies against part of Elastin will be helpful e.g. ab97963 and ab51599. Although these do not exactly match however it will help to widen your search. I hope this information is nevertheless helpful to you. Please do not hesitate to contact me if you have any further questions in this regard.